For homes with roofs that face to the south, and that have an appropriate pitch for mounting solar panels, installing an efficient home solar system is fairly straight-forward, because both the roof orientation and angle (pitch) are optimal for harvesting clean energy from the sun. And while there is some indication that facing solar panels to the west can also be quite effective, for the most part, those with east- and west-facing roofs face a challenge in installing a solar array that will produce clean power throughout the day. However, a new solar panel mounting system aims to alleviate some of the challenge of putting solar on east-west roofs (or non-south-facing roofs, as it were), and could open up the door for more potential solar homeowners to get the benefits of a solar array on their roof. 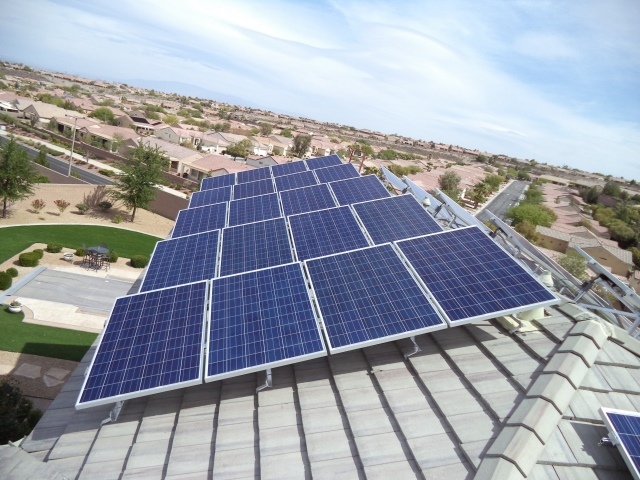 The new elevated solar mounting system, from TRA Snow and Sun, was developed for a client who had a customer with an extremely challenging solar situation, who wanted to install a solar array and qualify for a rebate from his utility company. One of the stipulations in the rebate requirements was that the solar panels could be faced no more than 70 degrees from true south, and this client’s roof had an east-west orientation, as well as being covered in concrete tiles. In addition, the solar panels and mounting system had to be able to withstand wind speeds of 120 mph, which is not exactly common for many homes, but which is necessary in extremely wind locations. If you’d like to go solar, but your roof isn’t optimal for mounting solar panels, solutions such as this one could be used to let you take advantage of home solar energy and qualify for solar incentives, regardless of your roof orientation or pitch.